I have spent hours pouring over The Artful Baker, and had my eye on two cakes in particular. But when it came time to bake one today, I realized that I didn't have enough chocolate for one and the carrots disappeared from the fridge that I needed from the other. 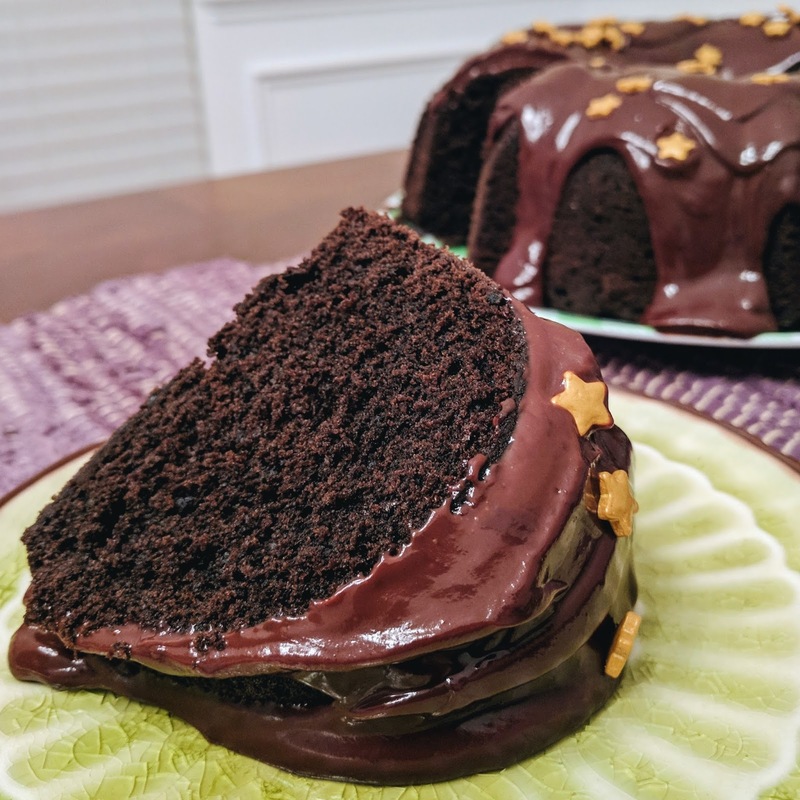 So I gravitated toward a recipe I have seen others from the ABRAMS Dinner Party making, the double chocolate bundt cake. So while I am not going to win an award for originality, we all need a few go-to recipes that come together quickly and are crowd-pleasers. Well I have your chocolate cake! What I love about this cookbook is that the author, Cenk Sonmezsoy, details the process he has undertaken for each recipe. For many, this means he explains where he started, what worked, what he changed, how it evolved. For this one, he does not see any improvements on the horizon, it is done, it is the best it can be, etc. 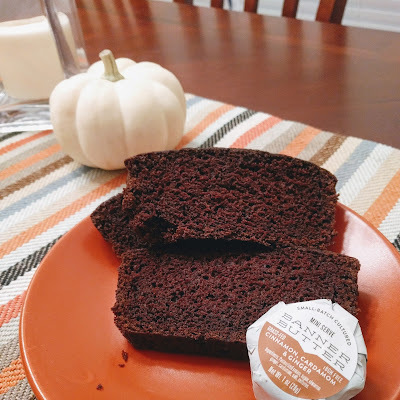 He made many chocolate bundt cakes on the way to this one. And we can all benefit from its deliciousness. Not too sweet, good structure, can be dressed up or down. Basically, this is the little black dress of cakes. Set a rack in the lower third of the oven and preheat the oven to 325 F (160 C). Generously butter a 10-cup (2.4 liter) Bundt pan. If your pan has an intricate design, use a pastry brush to reach all the nooks and crannies. In the bowl of a stand mixer fitted with the paddle attachment, beat the butter at medium-high speed until creamy, about 2 minuteness. Add the sugar and beat until light and fluffy, about 3 minutes. Add the eggs, one at a time, and beat for 1 minute after each addition, scraping down the sides of the bowl as needed. Reduce the speed to low and beat in one-third of the flour mixture, followed by half of the chocolate mixture. Repeat with another third of the flour mixture and the remaining chocolate mixture. Finally, add the remaining mixture and beat just until incorporated. Bake until a wooden toothpick inserted into the cake comes out clean, 50-55 minutes Set the pan on a wire rack to cool for 10 minutes. Invert the cake onto the rack, set the rack over a baking sheet lined with parchment paper, and let cool completely. In a medium saucepan over medium-high heat, bring the cream, sugar, and vanilla to just below a boil, stirring frequently. Take the pan off the heat and pour about half of the hot cream mixture over the chocolate. Stir gently with a silicone spatula until blended. Add the rest of the hot cream mixture, stirring gently until the chocolate melts completely. Immediately pour it over the cake, allowing it to drip down the cake. Using a cake lifter, transfer the cake onto a serving plate. The cake will keep under a cake dome at room temperature for up to 3 days. 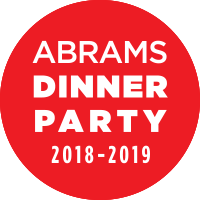 Being a part of the ABRAMS Dinner Party has pushed me to try more new recipes than I think I normally would during my busy time of year. 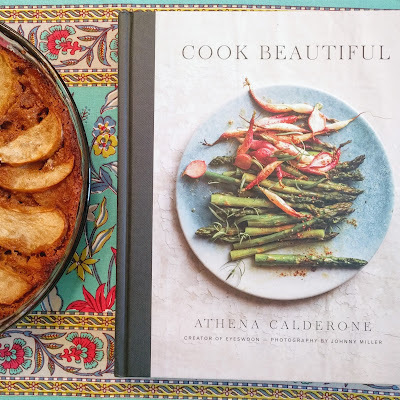 Cook Beautiful is enticing because it is divided into seasons, contains beautiful photography, and contains suggestions for decorating a seasonal table. I was also impressed how many recipes did not contain meat, helpful when you are married to a vegetarian! 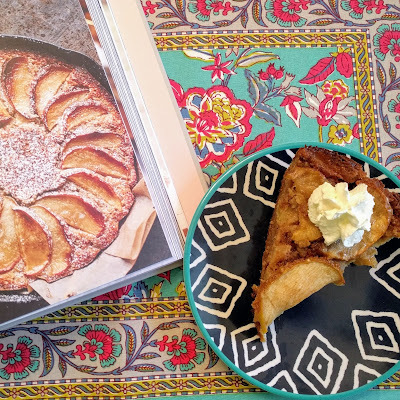 When I encountered this recipe in Cook Beautiful, I decided this would be a great candidate for recipe modification. I like to modify recipes to be lower carb and grain/gluten free so that everyone in my household can consume them. 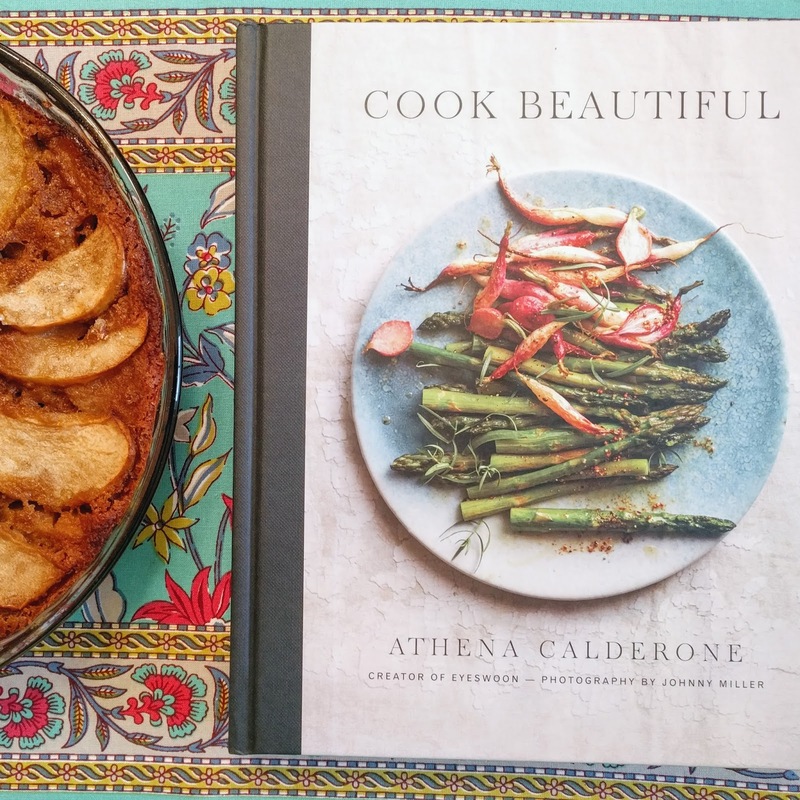 Recipes like this, that are baked and served out of the same pan, are prime candidates because there are fewer concerns about structure. Just the same, my end result had a satisfying enough structure that it would have stood on its own. I will start by posting the original recipe as it appears in the cookbook, and then go on to discuss the changes I made and why. Preheat the oven to 350 F (175 C.) Nestle a piece of parchment paper into an 8- or 9- inch (20- or 23-cm) cast-iron pan and grease it with butter. In a bowl, whisk together the flour, cardamom, baking powder, and salt. In a separate large bowl, beat the eggs until foamy. Whisk in the granulated sugar, cognac, and vanilla extract. Pour in the buttermilk and whisk to combine. Peel, halve, and core 2 1/2 of the apples, then cut them into 1/2-in-thick (12-mm-thick) cubes. Reserve the remaining half apple, unpeeled, and cut it into 1/4-inch (6-mm) slices, for the top. Add half of the flour mixture to the wet ingredients, stirring until just combined, then gently fold in half of the melted butter. Repeat with the remaining flour mixture and melted butter. Gently fold in the cubed apples, reserving the slices. 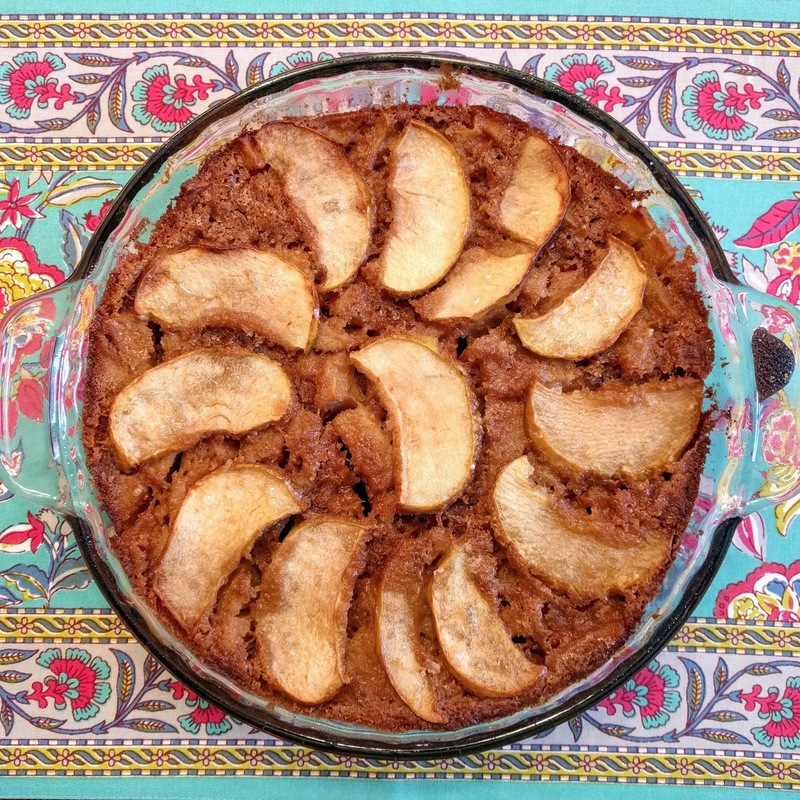 Transfer the batter to the pan and arrange the apple slices in a circular pattern on top of the batter. Sprinkle with the turbinado sugar. Bake until the cake turns a deep golden brown and a cake tester inserted in the center comes out clean, 55 to 65 minutes. Transfer the skillet to a cooling rack and let it sit for 5 minutes. 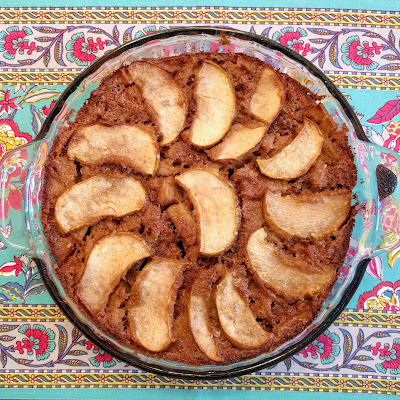 The cake may be served warm or at room temperature, directly from the skillet; whichever you choose, make sure to dust it with confectioners' sugar before serving. I have learned through years of experimentation and recipes (both good and bad) that the key to gluten/grain-free baking is never to use just one flour. Since I have all these flours on hand already, it isn't a big deal for me, but if you are starting from scratch, you might even consider just buying a gluten-free flour mix like King Arthur Flour. Per cup of all-purpose flour, I used 1/3 cup sorghum flour, 1/3 cup brown rice flour, and a heaping 1/3 cup tapioca flour. For the granulated sugar, I used 1/2 cup coconut sugar. Now this was a crap shoot, and I tasted the batter before baking, because coconut sugar is not as sweet as granulated, but too much of it can really alter the color and texture of the batter. It makes it appear as though molasses had been added. As sugar substitutes go, we prefer natural substitutes over chemical, even though they are higher calorie. As sugars go, coconut sugar is very low on the glycemic index, which suits our purposes. Other changes I made to the recipe - I had bourbon so I used that in my cute little OXO cup as pictured. 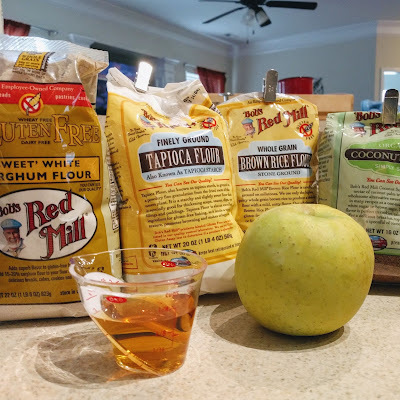 I had Mutsu apples from the local NC orchards, but they are huge: I used 1 1/2 diced in the batter and 1/2 unpeeled on top. I did not sprinkle with confectioners' sugar for presentation, nor did I use a cast-iron pan, just a pie plate. This was a successful modification, and I'm sure the original recipe is a delight, and would be a quick dessert to stick in the oven while dinner was consumed. 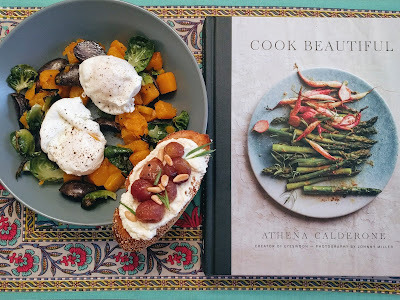 I did make dinner that same night from the cookbook: Meyer Lemon Ricotta Toasts with Blistered Grapes and Roasted Pumpkin and Brussels Sprouts with Poached Eggs. Everything was a success! 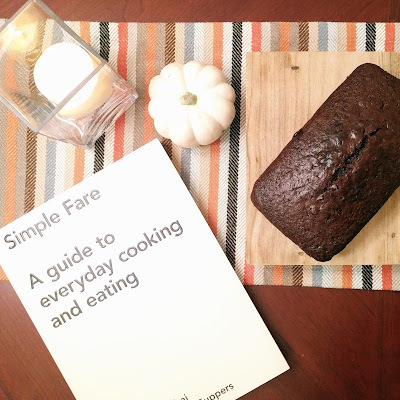 Usually when I get a new cookbook, I look for baked goods and sweet treats to make. While Simple Fare: Fall/Winter is full of savory dishes and beautiful photography, I was pulled in by this simple vegan chocolate bread, one where I would have the ingredients on hand on a typical day. I brought it to work and some people snatched second servings, praising it for its taste and texture. I believe the word "silky" was used. I found myself just a little sad that I'd decided to share. Preheat the oven to 350 F (175 C.) Lightly grease a 9x5 inch (23 x 12 cm) loaf pan with coconut oil and line it with parchment paper. Grease the parchment paper with more coconut oil and lightly dust the pan with cocoa powder, tapping out the excess. In a medium bowl, combine the coconut oil, espresso, vanilla, vinegar, and 1 cup (240 ml) water and mix until incorporated. Add the wet ingredients to the dry ingredients and whisk until smooth. Pour the batter into the prepared loaf pan. Bake for 50-55 minutes, until a tester inserted into the center comes out with a few moist crumbs, but not raw batter. Remove from the oven and let cool in the pan on a wire rack. Once cooled, remove the loaf from the pan. Cut into slices, and dollop each slice with crème fraîche and sprinkle with flaky salt to serve. Replace crème fraîche with mascarpone and cyprus flake salt with sel de guérande. Replace crème fraîche with butter and salt with cinnamon. A few weeks ago, I made quark for a German recipe. I needed to do something with the leftovers so I found a recipe for quark pancakes. I would imagine, lacking quark, you could use ricotta. These are light and fluffy, and highly recommended. The blogger that provided the original recipe served them with peaches and thyme, which would be even better. I just ate them with butter and syrup. Stir in the flour and baking powder until just combined (don't stress about lumps) and then fold through the butter. Throw the salt in with the egg whites, and whisk until they're foamy - don't worry about peaks or anything. Fold through the batter and put a large, heavy based non-stick pan on to heat. 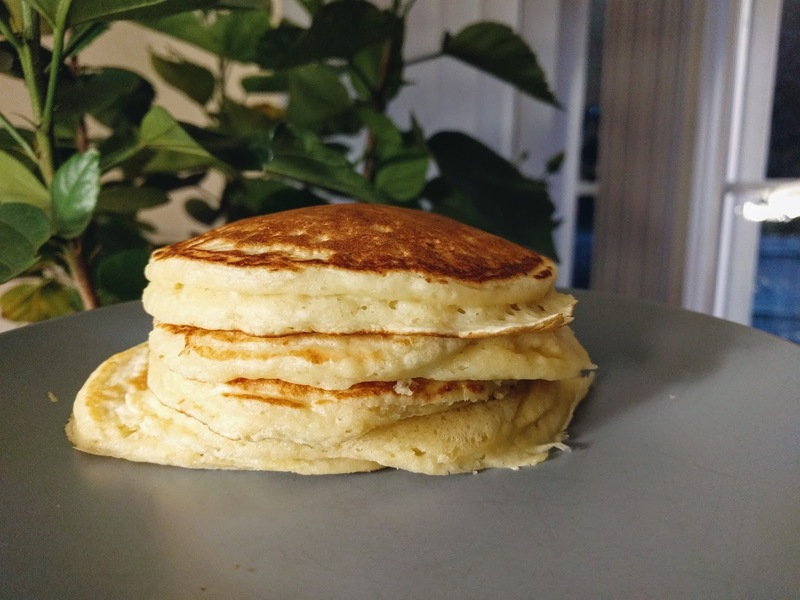 These pancakes cook fine without any oil in a non-stick pan, but I like to add a little butter (your call), and then ladle in heaping spoonfuls of the batter into the pan (about ¼ cup). Cook until bubbles appear on the surface of the pancake, and then flip and cook until the other side is golden brown. * - I did not separate the eggs nor did I whisk anything separately. As you can see from my photo, they are still the fluffiest. You might like them even more with these steps but I just dumped and mixed and cooked.